It is said that the cost of freedom is eternal vigilance. This is also true for the seeker seeking to maintain contact and communion with his highest spiritual center. Also of note is that freedom can be taken away in increments that are hardly noticeable until one awakens to an alarming loss; even so, for the seeker who does achieve a measure of soul contact. Loss of focus and tricks played on him by his lower emotional and mental selves can take him away inch by inch until he may not realize how great the distance is that he has traveled away from his soul. Even though soul contact is more real than the material reality the initial contact is very gentle and ephemeral – a little like a voice at a far distance that you are trying to discern through lots of interfering noises. Those noises are caused by distortions from the emotional self and illusions and scattered thoughts from the lower mental self. We have spent significant time on discussing how the emotional self blocks soul contact. More subtle though are the blockages created by the mind. The problem with the emotions is easy to understand. One may have a grievance or another negative emotion that takes his attention away from the inner peace of the soul. In a negative state the person just doesn’t feel like stilling the emotions and seeking higher contact. On the other hand, illusions from the mind can creep in when the emotional body is in relative peace. In that fairly tranquil state the mind can trick the seeker into thinking he has contact when such is not the case. When the seeker begins his quest he usually seeks some type of higher contact. In this course we use the term “soul contact”, but people seek this by different names. Seeking an answer from God is the most common description of the quest. Others say they are seeking the Holy Spirit, Jesus, the Higher Self, higher mind, nirvana and so on. It matters not what language you use, the process is the same. Your request must make it through the static of the lower emotions and mind. Even when the emotions are stilled the mind can create quite a barrier. Here is the most common illusion that creates a problem. When the seeker begins his quest the highest he will normally reach will be the higher parts of his lower emotional self. The feelings here are very powerful and can bring tears to the eyes, but they are still a part of your lower self. The seeker may be a step away from higher contact, but still connected to the lower self which can lead to much error. If the seeker is tricked into thinking higher emotional contact is the end goal then he will relax and it may be a long time before he becomes motivated to see through the illusion and take the next step. It is essential that the seeker learn to differentiate between the higher part of the lower self and the actual Higher Self. He cannot do this until he makes contact and he cannot make contact unless he is open to the possibility that he has not found the ultimate presence. None of the students reading this will have found the ultimate so all seekers need to proceed with the idea that there is something higher. Soul contact is the first major step, but there are others. The assignment today is to reflect on this lesson and what may be your personal barriers to discerning the difference between the higher emotional self and the true Higher Self. Contemplate on what your next step is in making higher contact. One of the reasons that this physical reality is so full of illusion, division and strife is that all physical reality is created on the principle of illusion. The original wavelength is created by the Purpose or Thought of God set in motion. All creation manifests through the illusion of the guitar string principle. Take a look at a single guitar string. It is one isolated string. But then pluck it and look again. What do you see? You see three strings – one on top, one on the bottom and one in the middle with a blurr in between. Even so, the one God set thought in motion and created the illusion of the Trinity, the three. The wavelength of science manifests this three. There is the top of the wavelength, the bottom and the middle representing the originating force. It is fascinating to consider that the whole visible universe is observable because of the simple guitar string principle. Since this physical reality is created on the principle of illusion we should not be surprised that illusion is all around us and distracts us from seeing the formless reality behind all form. The wavelengths and vibration of music in this reality are like the sirens of Ulysses. They draw us through illusion and drown out the beautiful music of the spheres, causing us to take erroneous paths that lead to disaster again and again until we fine tune our inner ear and find the true voice that leads to everlasting deliverance. When the seeker realizes that all things visible in the material world are founded upon illusion then he will take to heart the idea that illusion is everywhere. Piece by piece must the seeker find and unravel the illusions about him. There are illusions in politics, illusions in religion, illusions in science, and even math. There are lots of illusions about what is good for you, or your highest good; illusions about health and medicine, illusions concerning finance, about love and romance, about education, about reasoning and what is truth. There are more illusions than we can name here. Because of our great political division most are more than eager to find illusion or error on the other side of the aisle, but believe me, neither the liberals or conservatives have a monopoly on this problem. Find some real illusion wherein a flaw resides. It may be difficult if you have invested too much energy in demonizing the other side. The lower mind cannot dispel illusion by itself and needs some help from the higher. The higher mind is always there willing to assist us when we do our part to make contact. Very few make the needed contact until they finally decide to tread the path which will take them home. One exercise that all can do which will strengthen the link between the lower and higher self is in the use of seed thoughts. A seed thought is a phrase, potent with meaning, upon which the student contemplates with the goal of receiving greater light or inspiration. Sometimes a thought represented by just a few words, when contemplated, can provide enough inspiration for an entire book. After all, we are told that, “in the beginning was the word.” Could God have used one mere word as a seed thought that expanded into all there is? Interesting seed thought right there. One thing that helped me to realize the value of seed thoughts was that in my youth I memorized quite a few scriptures. Later on when I had boring jobs or was just doing a lot of driving with nothing to do, those scriptures I had previously memorized just seemed to float around in my head now and then. When this happened and I reflected upon them, often more understanding would come and I would see them in a light that hadn’t been there before. I began to realize the truth of the ancient Jewish idea that all inspired words had at least three meanings. They called this the body, soul and spirit of the scriptures. Still others believe that inspired words have seven meanings. Throughout my life I have found those memorized scriptures to be excellent seed thoughts. Sometimes 20 or 30 yeas after they had been memorized additional light would come when reflecting on them. One thing I discovered is that not all scripture, words or seed thoughts are the same. Some have more potency, meaning and harmony with the soul than others. Even some single words can provide powerful thoughts to contemplate. Examples of such words are, love, God, vibration, relationship, Spirit etc. A phrase is good though for it can contain potent words and have an overall potency in its entirety. For your assignment today I will give you a seed thought which has provided me with great light over the years. Let this thought run though your mind over the next day and see what additional thoughts come. When you realize additional light or understanding ask yourself if perhaps it came from your higher mind rather than your lower. If you pay attention you will sense the difference between something that comes from the lower mind or the higher. Memorize this scripture and let it come up often in your thoughts during the next 24 hours. You must ask yourself questions as you think about the seed thought as sometimes the questions reach the soul which knows the answer. For today’s affirmation use the seed thought. Did you stop there, or did you ask more questions? This is a key point for you. You must be the source of your own questions. A question given by another is only half a question. One created by yourself is a much stronger one and has more power to reach the soul. What is Jesus referring to when he speaks of freedom? How is truth related to freedom? How am I not free now? 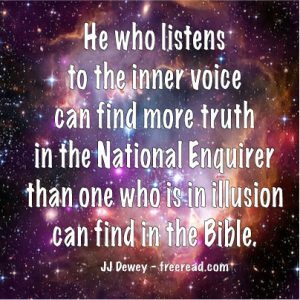 Is “the truth” a specific truth or truth in general? Don’t feel bad if you did not think to ask additional questions. Most others did not either. However, let this be a notice to you of the importance of asking your own questions. Asking questions is a major key to opening the door to soul contact. Asking questions is a key ingredient, but not the only one. The seeker must expect to get an answer. In an attitude of expectation he must throw the energies of his heart and mind on reflecting on the answer to the question. He must believe that he can find the answer. “Let light stream forth into the minds of men. First, read it over and ponder on its meaning, Then, after a period of reflection, come up with three questions about it. I will not give you any hints this time. See what you can do and then ponder on the answers. So… did you come up with the three questions? That is good if you did. Did you come up with more than three? That is even better. The reason that deserves praise is not because of skill in coming up with questions, but because you showed initiative and did more than is asked by an outward source. Remember in the last lesson that some made extra progress by showing the initiative to come up with their own questions, going beyond that which was suggested? Even so, a few here may have gone beyond the suggestion to cone up with three questions and come up with four, or maybe five or more. Again, if you went beyond that which was asked you have made an important step, a step common to those who maintain consistent soul contact. In saying this, I should stress that, for teaching sake, the process with these seed thoughts is sped up, as many seed thoughts may foment in the mind and heart for years, and then in a flash additional knowledge will come. That doesn’t mean you cannot receive light on them in a day, an hour or even an instant. You can. Reflection now will bring to you what you are ready to receive in the present. Continued reflection will expand your consciousness making you ready to receive more. After all, isn’t the light and love of God represented by much more than a point? The point of light idea has numerous layers of meaning but the most important one as far as the seeker is concerned is that he is a point of light within the mind of God. His real mind is part of the mind of God and his presence here on earth represents a single point among the billions of human lives. Even though we are all linked to the mind of God, few have manifested an actual point of light, but those who take this invocation to heart link heaven and earth so a point of spiritual light is manifest within their own minds. Then, from this point of light within, which is shared by the soul, the prayer is that your own soul contact will increase to he extent that you will fulfill the words of Jesus and become a light to the world. I’m not going to make suggestions this time. Just apply what you have already learned, plant the thought in your mind and contemplate. “Let love stream forth into the hearts of men. It is most likely that you asked your own questions this time. That is good and what is expected of you at this juncture. Now that you realize the need for questions the next step is to work on the quality. Most any question is better than none at all, but some questions lead to more results than others. In addition, the seeker needs to ask the right sequence of questions. One can ask five unrelated questions and obtain a little knowledge, but if he asks five linked questions then the knowledge gained may be much more profound. Let us ask a series of questions and see where it leads us. (1) What is the point of love? Answer: It is individuals like you and me, just as was the point of light. (2) What is the heart of God? Answer: In relation to this earth it is all the points of love that are manifesting through individuals and some groups. (3) How will it “stream forth into the hearts of men”? Answer: Love is contagious, but in a good way. When many points demonstrate love then it is as if a stream is created which cannot be ignored. The stream will carry many others along with it. (4) Are physical acts of love and compassion the only way to add to the stream? Answer: No. In your silent moments of prayer and meditation you can send forth feelings and thoughts of love to a waiting humanity. Every loving act, feeling and thought adds to the stream. (5) The seed thought ends with, “May Christ return to earth.” Is this speaking of the entity who was Christ or a Christ like spirit among humanity? Answer: Both. The love that was demonstrated by Christ must be demonstrated by many of us before He returns. Answer: A critical mass, enough people so the trend is toward peace, unity and love rather than war, division and hate. (7) How is this phrase related to the others? We gather in His name when we, as points of love, join in love and unity. A most important step in the return of Christ is our own return home to the love of the soul which is ever there waiting with outstretched arms. This gives you some food for thought, but do not stop here. Continue to reflect and ask questions, and remember, more than one interpretation can apply. The assignment today is the same as yesterday with the added note to attempt to improve the quality of your questions and see if you can link them so one answer sheds light on another. So, how did you do with yesterday’s affirmation? Are the questions coming a little easier? How about the answers? It is important that you listen after having asked yourself a question. Sometimes in silence a flash of insight will come. This is evidence that you are receiving from your soul. Focus and continue and results will come. We will now look at some questions and answers that may have entered your mind. Perhaps you had your own, just as valid, and that is fine. Examples are given to assist those who are ready to learn. The obvious question to ask here is, where is this center where the will of God is known? Most esoteric students would say that the center is Shamballa wherein resides Sanat Kumara, the Ancient of Days. He is the highest representative of the Will of God on the earth. He and His associates represent the head center of the planet. The Christ and his associates represent the heart center. Many contemplate this far and stop but there is more. The creations of God are vast indeed and there are many centers where at least a portion of the will of God is known. There is the Logos of our planet which has an awareness far exceeding our own, then you have seven very advanced beings called in the Bible, the Seven Spirits before the throne. Above them you have the Solar Logos and then a logos over seven solar systems. If we could ascend high enough we could arrive at the One Great Life which we call God. I’m sure He has plans that would boggle the minds of many of the great ones. Fortunately, there is a connecting thread that links the highest Life with the lowly self aware units we call humanity. Each self conscious unit has within it a center where the Will of God is known and from that center even a single human can sense his part in fulfilling Divine Will. The center in the human body related to the will is the crown chakra at the top of the head and from thence are elements of higher will distributed through your entire being. There are many things going on in your being of which you are not aware. We, however, desire to become aware of higher will so we can be conscious contributors and avoid being unconscious obstructionists. Your soul has a sense of the part you are to play in the current life in manifesting the Will of God. If you can therefore focus and listen you will get impressions about what you are supposed to do. If you follow a true impression when it comes then you will be given more. The more you respond the more you will be given and the stronger will be your sense that receives. How much of the will of God do I know? This question will be your seed thought for today. Do not say that you do not know any part of the Will of God because you do and you will discover this in the next lesson. So do not claim ignorance and not seek the answer, because you do know parts of Higher Will. I told you that you have a knowledge of portions of the Will of God and should be able to name them. Some did not believe this, thinking that obtaining the Will of God is beyond their grasp. But discovering many elements of divine will is not beyond your reach for you are an extension of Divinity yourself. Many have merely forgotten who they are. That said, I will list a number of things that are in harmony with Divine Will of which I am sure you will agree. (1) Love your neighbor as yourself. This was said by Jesus who was indeed close to God and most people, even non Christians and atheists agree with the basic idea. Do you not think this precept is in harmony with the Will of God? Our spiritual senses say yes. (2) Do unto others as you would have others do unto you. Do you not suppose that God’s Will is to follow this principle? (3) Apply the principle of forgiveness to the best of your ability. Again our spiritual senses agree with this. (4) Have faith that a dominating good will prevail. Does it not make sense that the will of God is guiding all things toward a good end? These are said to be written by the finger of God, but most of them are accepted by the masses. Of course, it would seem that the Will of God is against stealing, lying, murder and other basic evils. So, you see – you do know quite a few things that are in alignment with the Will of God. It is God’s will that we have our free agency. We are given this, even though it creates a lot of problems, many of them even blamed on God. As extensions of God we have within us all the creative powers of God. Because we have our agency we can use those powers to create any kind of world we want, good or bad. We collectively have created this world using the godly powers given us. It is not the Father’s Will that we cause each other pain and grief in this world, but it is a top priority that we have free will so we can learn from our mistakes. Therefore, we have manifested an imperfect world where many negative things happen that would not transpire if we had no freedom. The wise parent allows his child to go out and play, knowing he will get some bumps and bruises, but will learn from them. The parent would never directly hurt the child, yet because the child must have freedom to learn one must expect some discomfort in the process. From one way of looking at it then, your will, no matter what it is, is the Will of God, because the use of your will is the use of the powers of godliness that God has granted for us to employ. It is His will that we learn from our bad decisions and eventually bring all of our decisions in harmony with the originating unity which is God. Everything that happens, good and bad, is allowed by divine will so a greater good will be the end result of creation. On the other hand, when harmony with Divine Will is spoken of by teachers they are speaking of steps that take us toward the dominating good, not away from it. For instance, you may be presented with the choice to marry either person A or person B. Person A is the much better choice, the one you selected before you were born. But Divine Will gives you the freedom to make a mistake and marry person B. If you marry person B you are going along with Divine Will as far as using your freedom, but your actual choice is not in harmony with it. Thus, when we speak of being in harmony with the Will of God we speak of decisions which are in alignment. The seeker must value his free will, but he must also value the quality of his decisions and seek those decisions which assist all forces toward a positive end. Many people who are not aware of what soul contact is have sensed guidance from within in making major decisions in life. Decision points are great guideposts directing us toward true inner contact. Okay, we have expanded that seed thought on will. Even so, there is much more that could be said, but let us move on. (1) What is the difference between will and purpose? (2) Why are we told that we have “little wills”? (3) What is the purpose that the Masters know and serve? The first question was: What is the difference between will and purpose? So, did you come up with something? Did you feel satisfied with it? The important thing was that you registered the question, thought about it and tried to answer it. That is more important than being right. We are given a hint to the answer in the seed thought itself, which tells us that purpose guides the will. In other words, purpose originates the plan and will carries it out. Will and purpose are somewhat interdependent. The first line speaks about the Will of God, but not the Purpose. This tells us that we do not know the whole plan of God (purpose) but it is important that we realize the portion of the plan (Will) that applies to us. When the seeker senses higher Will he develops a natural desire to manifest it. The second question reads: Why are we told that we have “little wills”? The answer is twofold. First, we regular humans only correctly perceive a small portion of the plan of God. Therefore, no matter how determined we are we can only manifest a little of it with our little wills. Secondly, the power of will, even in advanced humanity is in the embryo stage and of small moment in comparison to the greater lives which perceive much more of the purpose of God. Purpose (or the true plan of God) must guide our little wills so they can have an effect. Humanity is the fourth kingdom in nature and Christ and His associates (the Masters) are the fifth. Just as humans perceive more than the animals (the third kingdom), the Masters perceive and understand much more than regular humans. But just as advanced animals seem almost human, advanced humans are almost like the Masters. Those who seek higher knowledge will at times tap into the minds of higher lives and catch a glimpse at the purpose which the Masters know and serve. When that purpose is perceived to any degree the will is stimulated and becomes more potent. The purpose and plan of God is different than purpose as seen by humans. Human purpose can be frustrated whereas Divine Purpose cannot. Once the seeker perceives Divine Purpose he knows that it will manifest and nothing can stop it. The only thing determined by humans is the amount of time the manifestation will take. Let us not see it as robbery to attain to the mind of Christ who sees the Purpose of God. Read, contemplate, absorb and ask questions. So how did you do on the last seed thought? Did you come up with questions and answers? This thought needs to be seen as more of a linked whole than looked at line by line. For instance, the first line is quite simple for it merely refers to the human race. But then it is asking that from the human race that the plan of light and love should work out and then to the third line that this plan will seal the door where evil dwells. The full plan is beyond the comprehension of humanity. All we can perceive is a small portion of it that affects us at this point in time. Humanity itself senses a portion of the plan, the most important part is to develop and express goodwill and love toward others of humanity as well as lower life forms. This we must also do on an individual basis, but to fulfill his part of the plan the individual must sense the impulse from his soul as to the direction his life is to take. More people get some type of soul impulse on this than is realized and if followed they are doing their tiny part in the great whole. This stanza calls for humanity to do its part in manifesting the Plan. Many think that God, Jesus or the Masters should come help us, but if we received too much help the whole purpose of incarnating on earth would be frustrated. Humanity must work out its own problems and do its part of the plan by using its own intelligence and initiative. So How is the Plan associated with Love and Light, and is there a reason Love is listed first? We mentioned that the Plan itself is related to love and goodwill, but light is also thrown in. Light and love make a complete whole. You cannot have one without the other. Light reveals and love accepts and embraces that which is revealed. Love brings together and light reveals reasons to maintain unity. Love is mentioned first because it is the dominating motivation of life in this great cycle. Finally, how will the Plan work out? This can have several levels of meaning but Djwhal Khul who gave it out near the end of World War II said the door was connected to the evil released by Hitler and associates. That door was not completely closed by winning the war but is still cracked open and needs to be sealed shut. Contemplate then on this great line in connection with the rest of the stanza and see what light and understanding come.